This unique approach—in which immunized humans transfer anti-malarial proteins to mosquitoes when bitten—is called a transmission-blocking vaccine (TBV). A few malarial TBVs have shown promise but they have not been widely tested due to unwanted side effects or limited effectiveness. A biotechnology advancement reported Monday, Oct. 8, in the journal Nature Nanotechnology describes how a University at Buffalo-led research team has devised a simple way to boost the efficacy of malarial TBVs. If successful, it could help reduce the spread of the disease, which kills more than 400,000 people annually, mostly small children in sub-Saharan Africa. "Malaria is a huge global problem. This approach—using a transmission-blocking vaccine—could be part of a suite of tools that we use to tackle the disease," says the study's lead author, Jonathan Lovell, PhD, associate professor of biomedical engineering, a joint program of UB's School of Engineering and Applied Sciences and the Jacobs School of Medicine and Biomedical Sciences at UB. Co-authors include researchers from Walter Reed Army Institute of Research, the National Institutes of Health, McGill University and the PATH Malaria Vaccine Initiative. Utilizing TBVs to fight malaria stems, in part, from how the disease is spread. Here is how it works: a mosquito carrying the disease bites a child and transmits the malaria parasite to her. Later, a non-infected mosquito bites the child, and this time it's the girl who passes the parasite to the mosquito. That mosquito later bites a new victim and infects them with the parasite. The development of effective TBVs—combined with bug nets, insecticides, anti-parasitic drugs and others types of vaccines—could help break this vicious cycle, proponents say. While a TBV would not directly prevent an immunized person from getting infected, the vaccine would reduce the odds that people living in that community get malaria, hopefully to zero. Prior research in this area has focused on techniques like genetic engineering and chemical binding of toxin proteins to boost TBV responses. Each strategy has potential, but they're also time- and resource-consuming. The biotechnology created by the UB-led research team differs in its relative ease of assemble and overall effectiveness, Lovell says. The malaria parasite's life cycle includes numerous stages. Different malaria proteins represent the best vaccine target antigens, which are proteins that a vaccine mounts an immune response against. To purify these antigens for a vaccine, they are often modified with a small chain of amino acids called a polyhistidine-tag. Researchers discovered that the antigens could be mixed with nanoparticles containing small amounts of cobalt-porphyrin and phospholipid. The cobalt-porphyrin, which is similar in structure to vitamin B12, is responsible for binding the nanoparticle to the antigens. The resulting structure is a next-generation adjuvant, which is an immunological agent that enhances the efficacy of vaccines. 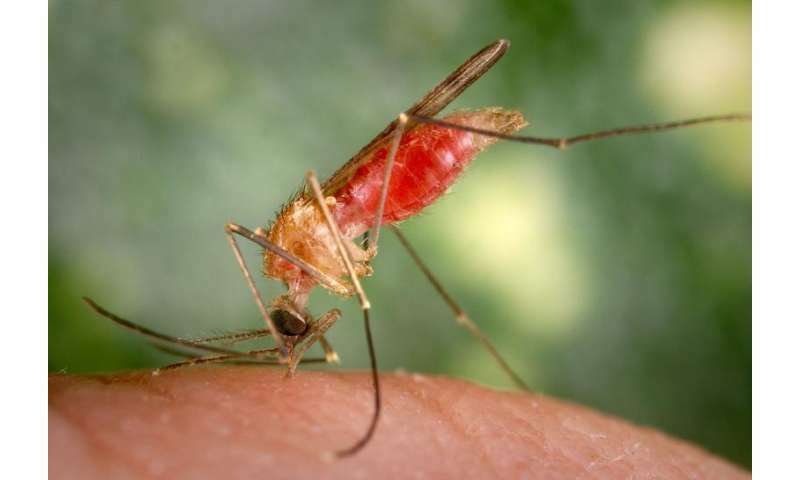 The vaccine works by inducing humans to make malaria-attacking antibodies, which are then transmitted to the mosquito as it bites the immunized human. In tests involving mice and rabbits, researchers showed that antibodies from a protein called Pfs25 effectively blocked the development of malaria-causing parasites inside the gut of mosquitoes. Additional tests paired the adjuvant with multiple malaria antigens, suggesting its promise for blocking the spread of malaria at numerous stages of the disease. The research team's next step is to prepare additional experiments that will justify moving the technology into human trials.